TUCSON, AZ (Tucson News Now) - An organization aimed at preventing deaths along the border will release new information Wednesday, Jan. 17, in hopes of preventing more people from dying. "No More Deaths" volunteers said there is a crisis along the US- Mexico border and they would like to see some changes. Humanitarian volunteers with the organization said people cross the border for a variety of reasons, but they contend that every day Border Patrol agents are making it more difficult. Volunteers accused agents of tampering with water containers and other supplies people need to make it across safely. They are concerned it is going to get worse due to harsher immigration talk from the Trump administration. 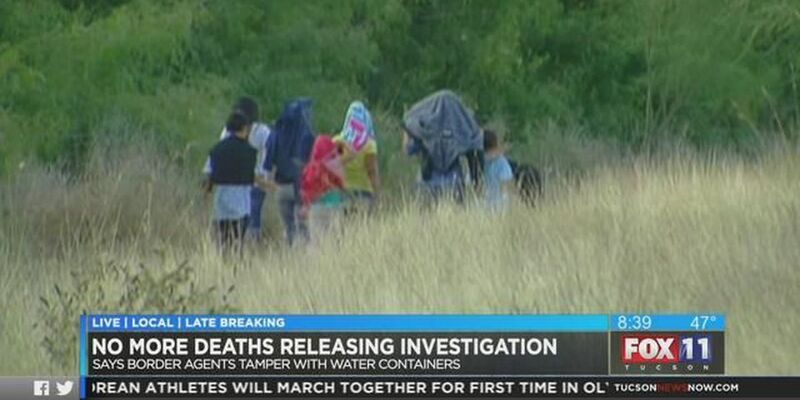 Tucson News Now reached out to the Border Patrol about the No More Deaths' investigation. All agents in the Tucson Sector have been instructed not to remove or destroy water stations, food or other resources left along trails in the desert. The Border Patrol is aware of the video from approximately six years ago depicting agents damaging water bottles. The Border Patrol shares a common goal with Non-Governmental Organizations to preserve human life and to prevent injury. We do not condone or encourage destruction or tampering with any water or food caches. Furthermore, anyone aware of these activities occurring is encouraged to it immediately to the Border Patrol. Border Patrol has invested in a wide-range of programs, resources and infrastructure to allow agents to accomplish their border security mission and preserve human life. Unfortunately, most who choose to enter the U.S. unlawfully are unprepared for the harsh desert environment and life-threatening dangers they will face. Border Patrol advises anyone in need of assistance, or any person who encounters someone in distress, to call 9-1-1 or activate a rescue beacon. The Tucson Sector Border Patrol also works with Non-Governmental Organizations and foreign governments in an attempt to locate and recover missing migrants through various means using the Missing Migrant Program (MMP) which serves as a centralized third party missing migrant reporting mechanism. The U.S. Border Patrol is committed to enforcing federal laws to secure our nation's borders while ensuring the safety and security of all individuals. Many people put their lives in the hands of smugglers and criminal organizations who have a complete disregard for human life. Border Patrol welcomes and encourages communication and cooperation with any agency or organization to better serve and protect those within our nation's borders. Citizens can report suspicious activity to the Border Patrol and remain anonymous by calling 1-877-872-7435 toll free.